The Muscatine Attendance Office phone number is 563-263-6616. Please use this number when calling in for a student absence, early release, etc. Seniors: Senior March will take place on Oct. 9th from 12-2. Pick up your permission slip in Student Services. Cost is $5. Chemistry Olympiad – There will be a meeting on October 7 at 12:20 for anyone interested in Chemistry Olympiad: a contest sponsored by the American Chemical Society. The meeting is in the auditorium, so please finish lunch before:no food and drinks allowed in the auditorium. For more information, please contact Mrs. Kramer. S.O.A.P. – September is gone! Come begin October with S.O.A.P. We meet this week on Thursday at 3220 Tipton Road at 7:30. Bring a friend and join us. Come celebrate the Chinese Autumn Moon Festival when the Confucius Institute at the University of Iowa hosts “Amazing China,” a spectacular production by the Confucius Institute of Chinese Opera at Binghamton University. Don’t miss outstanding performances by Binghamton University faculty, the National Academy of Chinese Theater Arts faculty, and guest artists from the New York Chinese Traditional Art Center. The next meeting of the Gay Straight Alliance is next Wednesday is Wednesday September 30 at 3:45 in room 229. Bring a friend and be ready to make some posters!! (Fall treats provided). Boys Basketball Open Gym will be held on Thursday, Oct. 1 beginning at 7:00 p.m. – 8:30 in the MHS gym. Most open gyms will be held on Monday and Thursday nights at the same time. Model UN: There will be a parent meeting on Thursday, October 1st at 5:00pm in Ms. Hansen’s room (11-024) for parents of any juniors and seniors who are interested in attending the international trip. Girls’ Basketball: There will be open gym at 5:30pm on Thursday evening in the main gym. Key Club: Our next meeting is on Friday, October 2nd at 7:30am in the auditorium. Please bring any MCSA donations from Cardboard Overnight to the meeting. The Bell twins are stars on the basketball court and comrades in life. While there are some differences—Josh shaves his head and Jordan loves his locks—both twins adhere to the Bell basketball rules: In this game of life, your family is the court, and the ball is your heart. With a former professional basketball player dad and an assistant principal mom, there is an intensely strong home front supporting sports and education in equal measures. When life intervenes in the form of a hot new girl, the balance shifts and growing apart proves painful. Come check out this great book (and others) in the library! Seniors: Reminder – Baby pictures/ads for the yearbook are due October 2. Everything needs to be turned in at the same time. Please check your email for more information. The next meeting of the Gay Straight Alliance is next is Wednesday, September 30 at 3:45 in room 229. Bring a friend and be ready to make some posters!! (Fall treats will be provided). The Environmental Club is selling Infuser water bottles $5 in Room 146. Exploring College Options – A unique program featuring five of the country’s leading universities: Duke, Georgetown, Harvard, Stanford, and University of Pennsylvania. At each event, representation from the five school will offer brief side presentations about their institutions and answer your questions about the sometimes-mystifying world of college admissions. You will learn about what distinguishes one fine university from another, what competitive colleges look for in the selection process, and what you can do to enhance your college application. The event will take place on Oct. 1, 2015 7:30-9:30 PM at the DoubleTree Cedar Rapids Convention Center. Register at www.exploringcollegeoptions.org Contact Info: 202-687-3600. There may be parking fees at some event locations. The Juntos program is looking for 4-5 students who would be interested in providing child care to the siblings of students participating in the program. Juntos runs for five Sunday evenings from 4-6:30 starting October 4th. Please see Mrs. Hawkins (Guidance Office in Student Services) if you are interested in volunteering. Colorado PTO needs volunteers for their Fall Festival on Friday, Oct. 2. Volunteers will need to arrive at 4:40 and stay until 8:30 PM. If interested, please contact Heather Noll at heather.noll@mcsdonline.org or text 563.260.8251. Please leave a name and number where you can be reached. Senior Resources is looking for dependable, hardworking Chore Workers* to provide lawn care and/or snow removal services for Seniors. Positions open immediately. $11 per hour!! Workers must be able to pass a background check & have their own equipment. 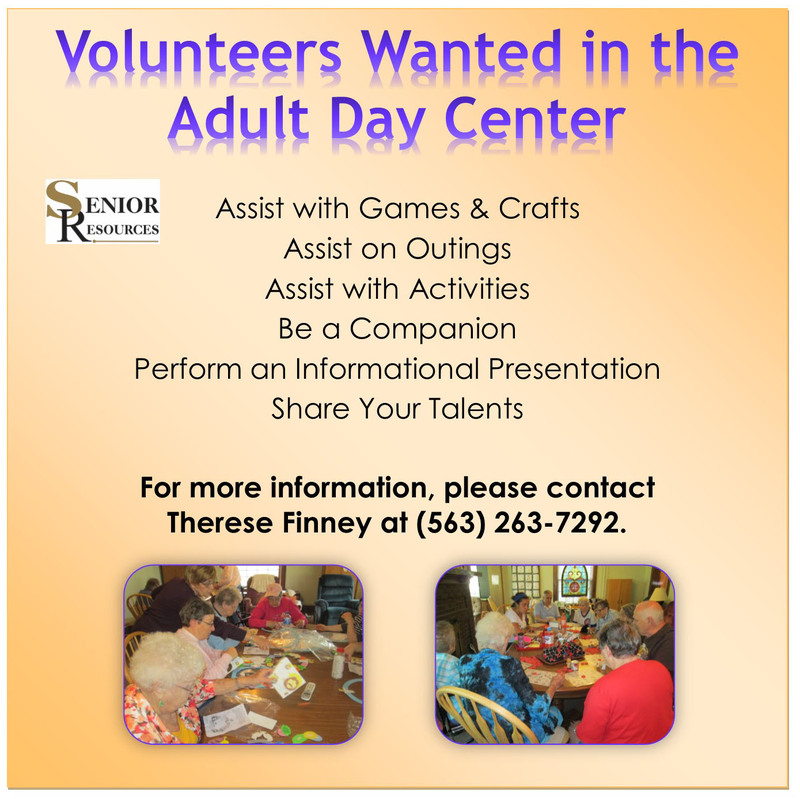 Contact Angela for more information at 563-263-7292.